As a soloist, Amber’s highlights include performances at the Gewandhaus with the Leipzig Academic Orchestra in Germany and with the Seattle Symphony in community concerts. She has performed at major venues and festivals such as Benaroya Hall, Kimmel Center, Raleigh Chamber Music Guild Series, and the Arizona Bach Society. Amber was a member of the Young Eight string octet, an all-Afro-heritage ensemble devoted to spreading a positive message to underserved communities through classical and hip-hop music. She has performed the Franz Anton Hoffmeister Viola Concerto and Ralph Vaughan Williams’ “Flos Campi” for solo viola, orchestra, and choir. Amber is adjunct professor of viola at Seattle Pacific University and works with the Los Angeles Philharmonic’s National Take A Stand Festival as the junior orchestra’s viola coach. 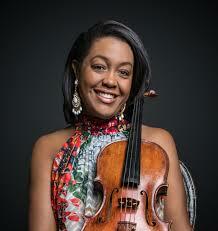 She taught viola at Seattle University and was on the faculty of the Burgos International Music Festival in Spain. During Amber’s tenure at Seattle University, the viola studio was one of two collegiate ensembles in the U.S. selected to perform at the largest viola conference in the world. Amber was born and raised in Houston to parents from the Dominican Republic and Panama. An avid interest in her heritage has fueled her continuing research into and performance of music by African-American, Afro-Latino, and Spanish composers. Amber is married to violinist Ervin Luka Sešek. They are the chamber music force CernaBella, and the founders and instructors of the Sešek String Studio.